Cabinet, or upright refrigerators, are an essential part of any kitchen, providing you with the levels of flexibility and convenience that every restaurant, pub, takeaway and cafe needs to maintain speed and efficiency without sacrificing quality. Enviro Chill supply and install the very best cabinet refrigerators from our Liverpool base throughout the UK to meet the specific requirements of your business. Whether you need a one-door or two-door cabinet refrigerator, the team at Enviro Chill will make it happen. 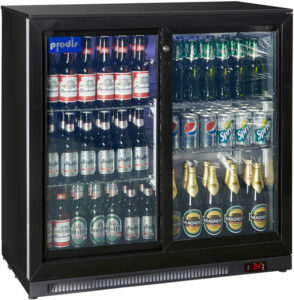 Our commercial upright fridges are specifically chosen for their high quality components and energy-efficiency, helping you to run your restaurant as easily as possible. At Enviro Chill, we understand that every restaurant wishes it had more floor space without having to reduce the amount of food storage. Upright commercial fridges are a great way to achieve this, making them perfect if your kitchen is too small for a chest freezer or you simply need to use your floor space for other appliances. When you work with Enviro Chill, we’ll help to source the commercial cabinet refrigerators that’ll best suit the needs of your kitchen for maximum productivity. As well as supplying your restaurant with the high quality cabinet refrigerators you need, we’ll then install them to a professional standard, so you can start using your new upright fridge with no hassle or worry. We value providing you with excellent customer service, and our engineers often go the extra mile to ensure all our clients are completely happy and satisfied with our products and services. Our experienced and professional team have worked in the industry for many years and regularly attend training events to ensure they provide you with the highest standards of installation. Additionally, we can offer you exceptional maintenance contract to ensure your new cabinet refrigerators are working at their maximum efficiency at all times. For more information about how the team at Enviro Chill can supply and install your commercial upright refrigerators, give us a call on 0151 2851818 or get in touch with us online today.